1. The Waiting is THE HARDEST PART – Tom Petty was spot-on (can’t you hear his song now). We arrived at 11:30 a.m. which was sort of what I expected. A long line was already forming, so we joined the crowd, slowly shuffling our way closer to the ticket line. I packed a lunch, so we ate in line to keep ourselves somewhat occupied. It started to drizzle. It was a bit cold… Ugh, are we there yet?! 2. To avoid waiting, you have some options: Just buy advance tickets, or bring a stroller, so you can use the accessible entrance. People were walking right in with strollers! With our 3 and 5 year old, we opted to leave the stroller at home. BIG. MISTAKE. HUGE! 3. You think waiting builds character…and maybe it does. I think I was the grumpiest out of everyone in our family (shame on me), but overall, everyone made the best of it. It was 1.5 HOURS in line, so I was very proud of the kids and Daddy O. (not to mention myself) for keeping it together. 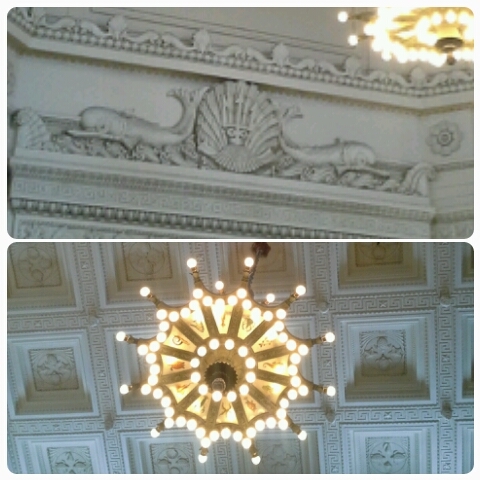 Whales, shells, starfish and more in the main atrium of the Shedd Aquarium. 5. It was well worth the wait! We were able to buy the exact ticket package that we wanted: main admission including the Aquarium Galleries, Wild Reef, and the Oceanarium. This meant we could go everywhere in the Shedd, but skip the dolphin and beluga whale show and 4D movie experience. 6. 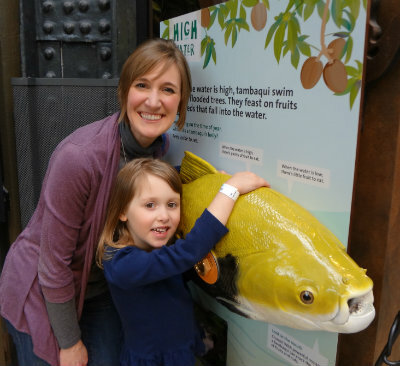 Our favorites – My daughter and I loved seeing the beluga whales in the Oceanarium. They just floated and zipped through the water so gracefully. 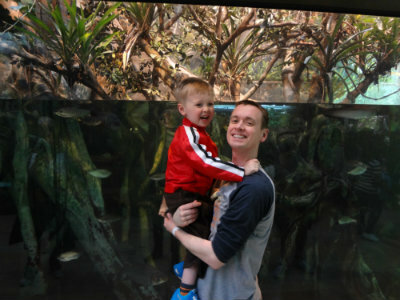 My son LOVED the sharks in the Wild Reef area. 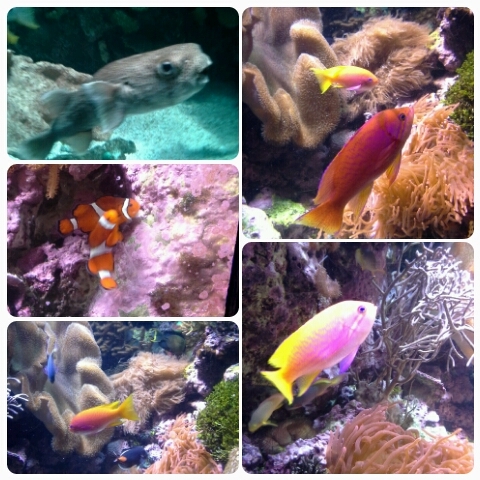 The tropical fish and their brilliant colors made me feel like I was on vacation a half a world away without the big, fancy vacation price tag. This makes me feel like snorkeling! Little brother could have stayed here ALL DAY! 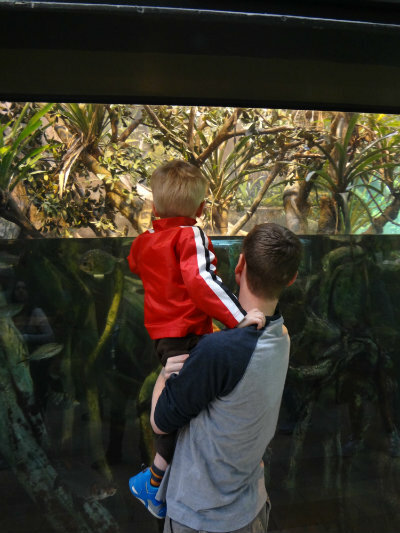 Final Verdict – the Shedd Aquarium is a very enjoyable, family-friendly attraction. I would highly recommend checking it out, and with a little more advance planning, I’m sure we’ll be back. 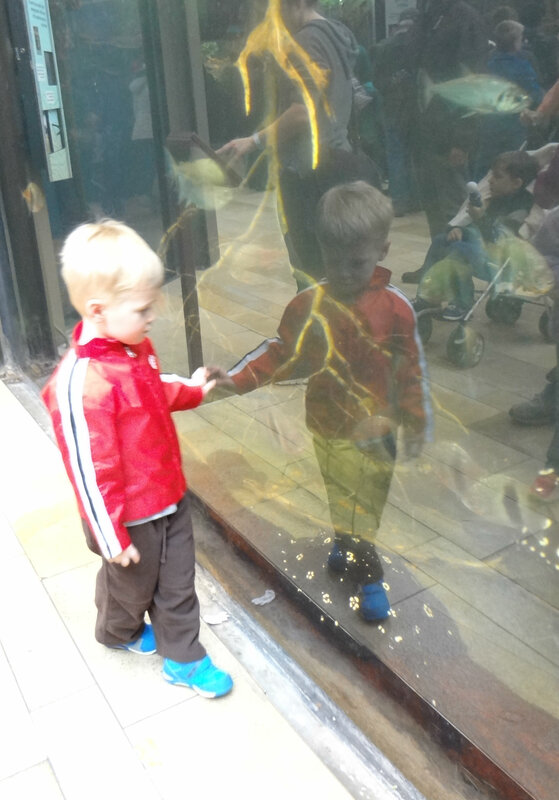 This entry was posted in Family, Kids, Travel and tagged aquarium, Chicago, family fun, Shedd Aquarium, Spring Break by Cathy O. Bookmark the permalink.